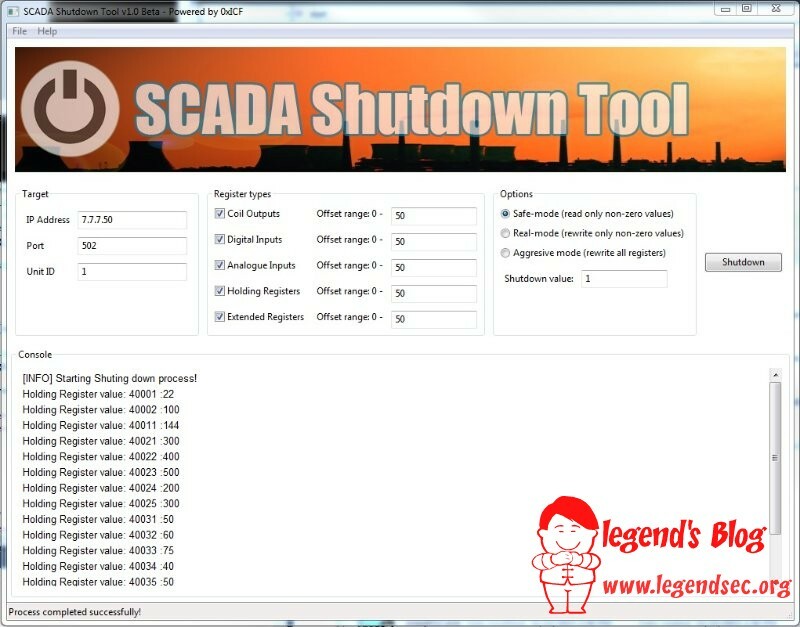 SCADAShutdownTool is industrial control system automation and testing tool allows security researchers and experts to test SCADA security systems, enumerate slave controllers, read controller’s registers values and rewrite registers data. SCADAShutdownTool allow enumeration of all registers types of a controller include coil outputs, digital inputs, analogue inputs, holding registers and extended registers. Safe-mode: Read-only and list non-zero values. Real-mode: Rewrite only non-zero values. Aggressive-mode: Rewrite all controller registers. Controller registers can be rewrite with the default value or “shutdown value” that specified by the user. SCADAShutdownTool developed for research purposes only, it is strongly recommended that you do not use this tool for illegal purposes. SCADAShutdownTool allows a malicious attacker to scan, fuzz and execute a remote command on a SCADA networks, Industrial Control Systems and controllers. 0xICF will not be responsible for any damage that caused by using this tool.